Outside air (OA) is required to dilute contaminants generated within a building. Those contaminants are the result of both the occupants and the building itself. Providing too much outside air during minimum intake mode is costly since it wastes energy; too little results in unacceptable air quality. How much outside air should you provide? Although there is considerable debate about the quantity of outside air required for acceptable occupant health and productivity, ASHRAE Standard 62, Ventilation for Acceptable Indoor Air Quality, is generally accepted as the authoritative document in the United States and Canada. The Standard, updated in 2013, specifies outside airflow rates as a combination of occupancy and building floor area. Regardless of the type of air system your building has, outside air must be provided. External factors such as wind and stack pressure effect can have a dramatic outcome on uncontrolled outside air intakes. 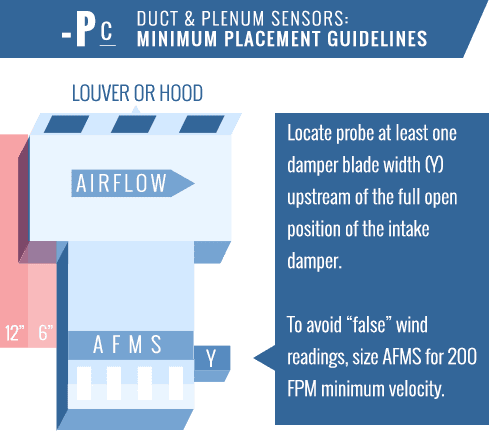 VAV systems have the added factor of mixed air plenum pressure variations that also have a dramatic effect on intake rates. 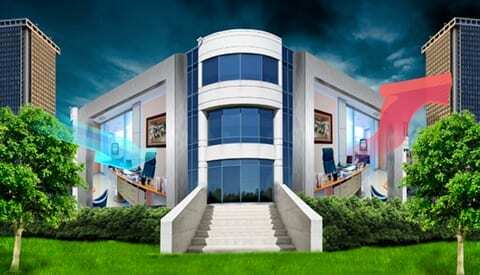 The latter, is currently addressed by ASHRAE Standard 62. Unfortunately, the Standard does not address wind and stack pressure which influences all systems. Install an EBTRON airflow measuring device directly in the outside air intake of ALL air handling systems that are installed to provide outside air to the occupant breathing zones. EBTRON manufactures a complete line of airflow measuring devices specifically designed and tested for installation in outside air intakes. Your local representative or our in-house application specialists can help you design a system that assures proper dilution ventilation into your building. In addition to selecting EBTRON equipment, you should also pay close attention to the dampers and control strategies you select. Remember, the performance of the system is only as good as its weakest link. Use design conditions to set a fixed outside air rate at the AHU in accordance with the Ventilation Rate Procedure and use an outside airflow station to maintain that level. Note: Traditional CO2 Demand Controlled Ventilation (DCV) is risky since numerous assumptions including respiration rate, sensor accuracy and placement and the transient nature of the technique result in serious ventilation rate errors. In addition, a fixed CO2 setpoint used in most DCV strategies can predict a fixed ventilation rate per person at best. 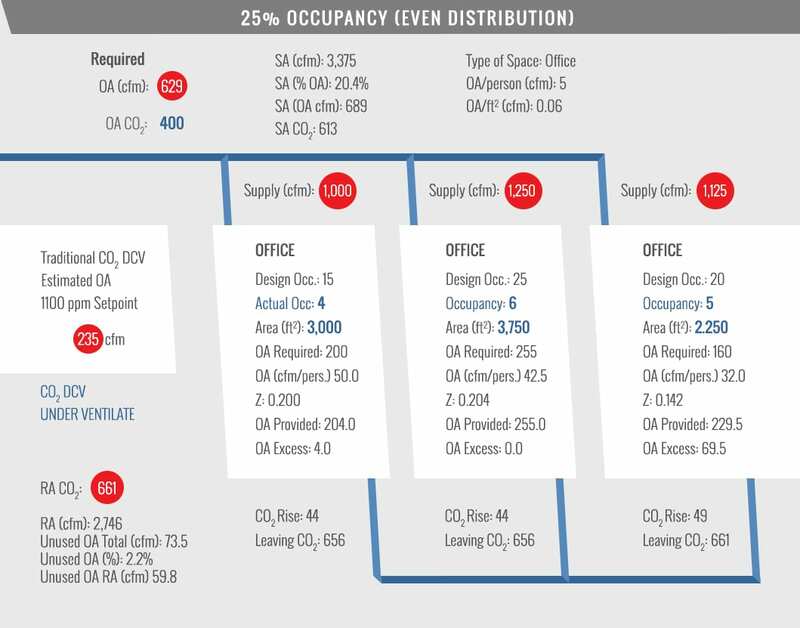 Unless occupancy is extremely variable, there is little to gain by using CO2 DCV with the new requirements of ASHRAE 62-2013. For example, changing the population density from 7 to 5 people per 1,000 sq.ft. will only reduce the outside air required from 85 to 75 CFM. Is CO2 DCV really worth the risk? Consider using occupied/unoccupied switches to reset outside air based on design occupancy of variable occupancy zones. Use occupancy counters, schedules, etc. with accurate airflow measurement (including accurate zone measurement on VAV systems) to reset the outside air setpoint dynamically. 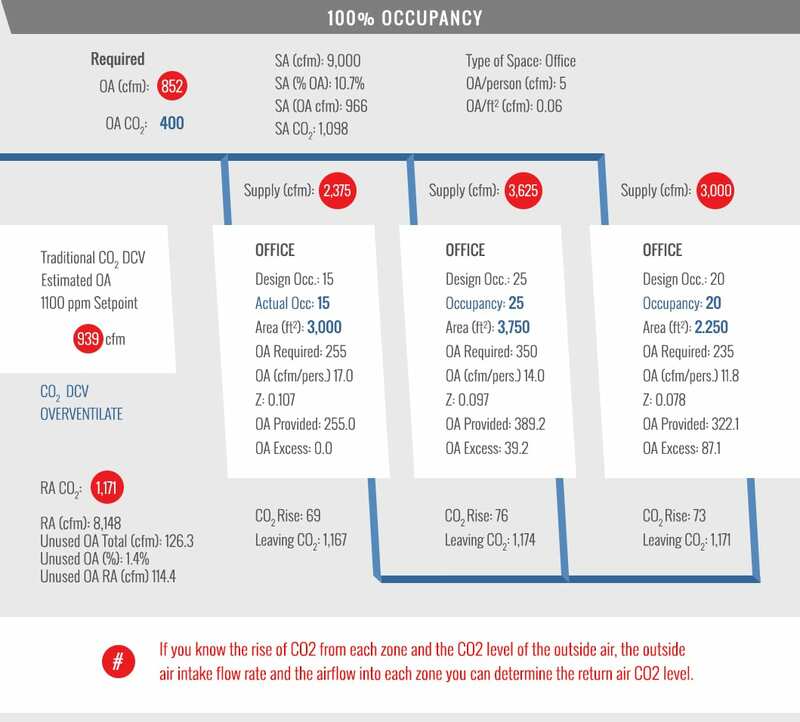 (note, some designers using CO2 DCV treat multiple occupancy zones as a single zone). Establish the minimum and maximum outside air ventilation rates required. Generally, the minimum rate will not be less than 40% of design due to space generated contaminants. Install an airflow measuring station in the outside air intake. Use the CO2 level to reset the outside air intake setpoint between the minimum and maximum levels. This technique is more stable than direct reset to CO2 levels, saves energy when the building is fully occupied and minimizes risk at lower population levels. Use the guidelines established for a single occupancy zone. 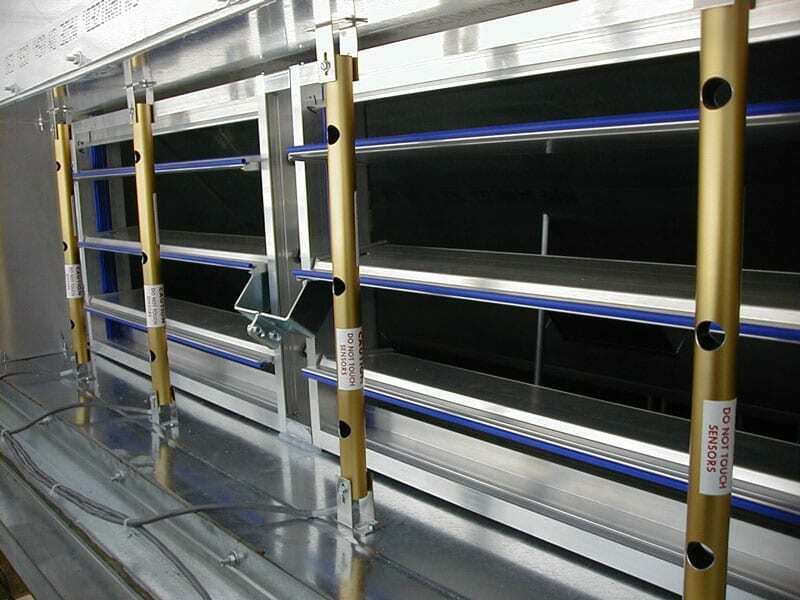 In addition, install an airflow measuring device in the supply air to each occupancy zone. Also install a CO2 sensor in each zone. Use the airflow measuring devices and the CO2 sensors to estimate the population of the critical zones. Determine the outside air setpoint using the guidelines of ASHRAE Standard 62 (you are basically using the multi-space equation dynamically at actual, not design, conditions).